WHO: Maya Deren directed this. an animated, approachable female figure (Maya Deren) alternately framed in high contrast against a pair of interchangeable doorways, beckons a seemingly naïve young dancer (Rita Christiani) into a large adjoining room to assist in an implied Sisyphean domestic ritual before being summoned by a striking, cosmopolitan figure (Anaïs Nin) awaiting in an opposite doorway. WHY: The cost of striking and renting 35mm prints is reaching ever-escalating heights. If the Pacific Film Archive 's upcoming complete Pasolini retrospective is being charged the same amounts a friend programming in another North American city mentioned he was quoted to screen some of the Marxist filmmaker's key works, there's no way they're making up the cost in ticket sales the old-fashioned capitalist way. It's no wonder that for-profit venues like the Castro are becoming more reliant on cheaper DCP technology to source their screening content (though its excellent September calendar is thankfully relatively light on repertory titles screening digitally). As bleak as things might get for continued 35mm distribution, however, I'm optimistic that film-on-film exhibition will not die before audience demand for it does. Networks of archives and collectors who recognize the unique qualities of the film medium will continue the tradition of screening reels of films through mechanical projection equipment. The selection of titles may become more limited geographically, consisting more and more of titles that don't have to be shipped in heavy canisters for thousands of miles, but in a place like the Bay Area, with its many collectors and official and unofficial archives, the number of available titles will still be practically inexhaustible, as long as support from audiences encourages collaboration between local collectors and venues. As the organic food crowd has gravitated to the sustainability of the locavore movement so too can cinephiles encourage a community-based alternative movement to massive and costly distribution. It just needs a good name. Perhaps someone can think of something better than "parokinal" (my awkward mash-up of "parochial" and "kino"). I don't know where the Vortex Room sourced its print of Car Crash last night, but I wouldn't be surprised if it was a local collector. Local collections also form the backbone of programming at both the Niles Essnaay Silent Film Museum in Fremont, CA (which has revealed its September Saturday night schedule, and, via pdf, all its other screenings through the end of October) and the Berkeley Underground Film Society. The Psychotronix Film Festival is giving film purists a rare chance to see 16mm projections at the New Parkway in Oakland this Sunday. Even the Pacific Film Archive sometimes supplements its 35mm programs with 16mm prints of varying provenance; the Wendell Corey series starting there tonight is mostly in 35mm, but includes one DCP presentation (Sorry, Wrong Number) and two 16mm shows (Anthony Mann's The Furies tomorrow night and series closing Elvis vehicle Loving You). But in San Francisco, Oddball Films is the king of the "parokinal" universe. A vast 16mm archive stored in a Mission loft that also houses its director Stephen Parr, Oddball has been screening selections from its collection weekly for years. Tonight's program curated by Scotty Slade is both typically diverse and notably deep. 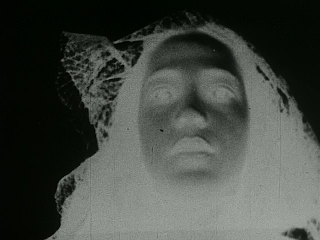 Entitled "Aligning the Trance Particles", Slade's selection includes experimental films like Ritual In Transfigured Time and Pat O'Neill's 7632 as well as ethnographic documentations like the 1964 Pomo Shaman and even a prize-winning scientific film made by Carol Ballard (of The Black Stallion and Never Cry Wolf fame) called Crystalization which captures imagery through an electron microscope. I'm planning to go. See you there? HOW: If tradition holds, all the films in tonight's program including Ritual in Transfigured Time come from Oddball's collection of 16mm prints.